This interest in ‘everything’ and in creating an extensive-as-possible collection was admirable. 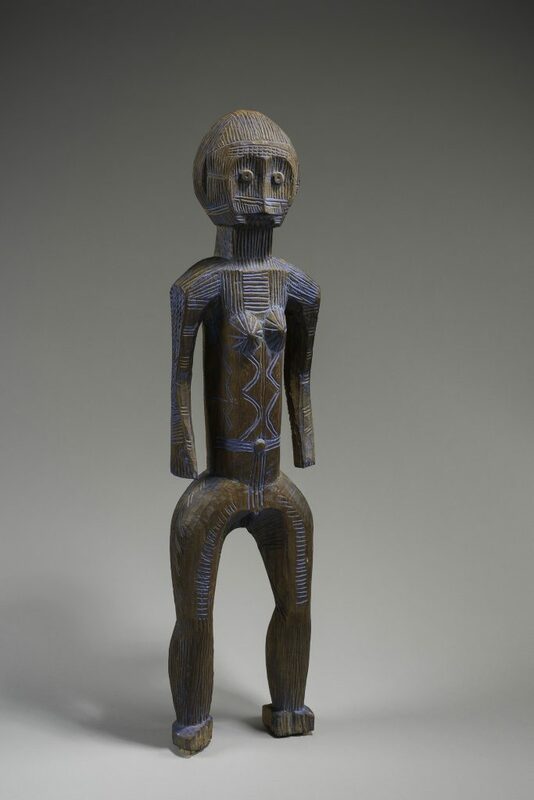 Let’s remember that not all peoples of the Congo created masks and statues. 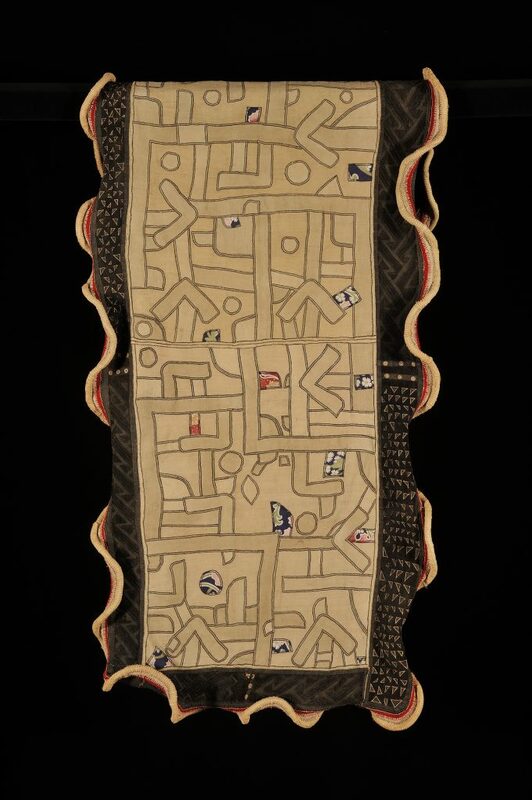 Limiting the collection to that kind of artistic production would have created a huge blind spot in our knowledge of Congolese material cultures. And imagine the consequences of such a limited selection for Rwanda, the so-called ‘maskless and statueless country’. Beauty and function reside at the heart of these so-called everyday objects, the exhibition of which sometimes still needs defending. 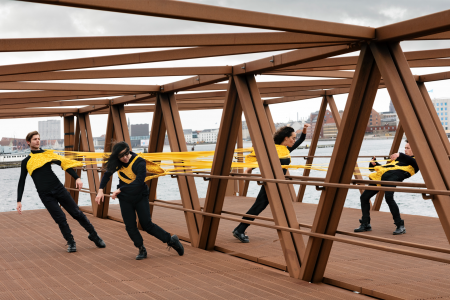 Some people condemn it, believing it to play into a ‘neo-colonialist European view’ that reinforces folkloric stereotypes about African cultures. I will leave the reader alone to judge the relevance of such a viewpoint. 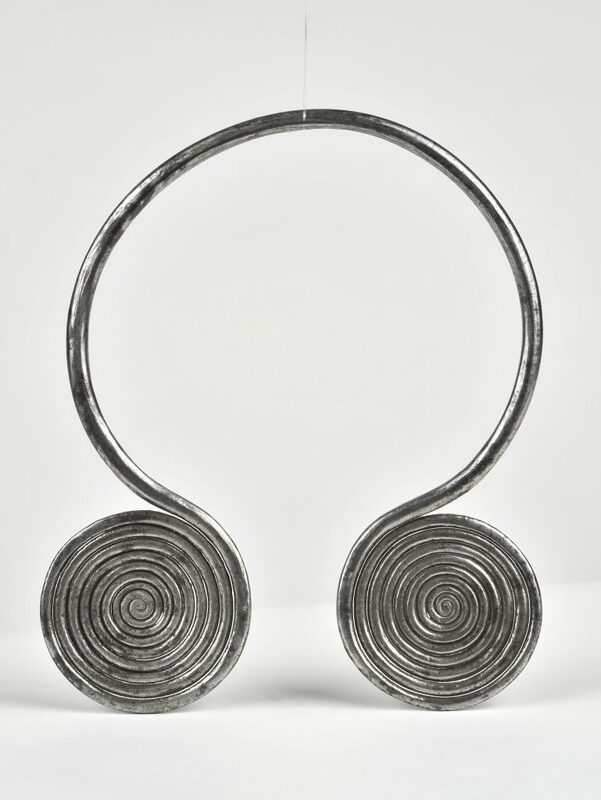 Wearing the ikembe torc was the privilege of married Mondjombo women. The monetary value of these adornments was significant, and neighbouring populations integrated ikembes into their commercial transactions without necessarily beginning to wear them. As a result, they were found further north in the Libenge region, where they were called bongas. Between 1900 and 1910, five bongas could buy a slave. The tight weave of these shields can easily stop arrows in their path. Several examples were collected in the Basoko region, notably from the So. 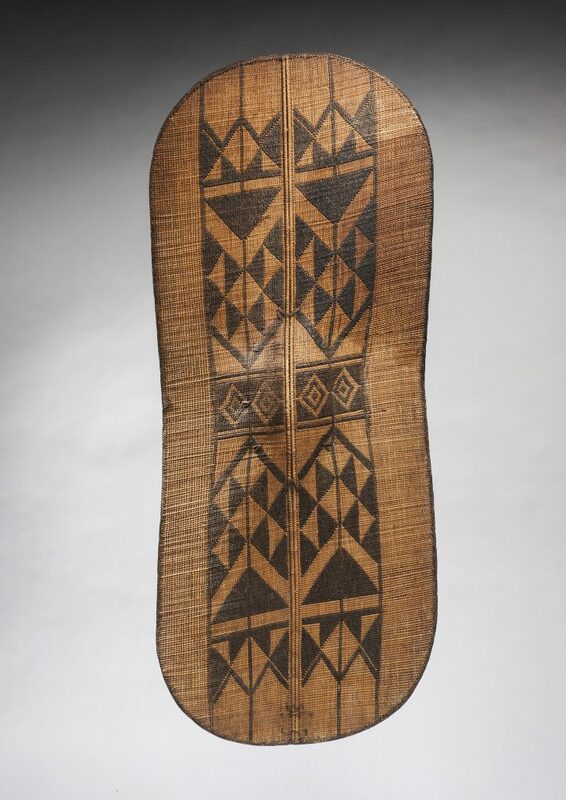 Some writers have specified that similar shields (ngabo) were also found among the Baali. It is likely that these ngabos were traded around the Aruwimi River. People used elembo chairs as thrones. 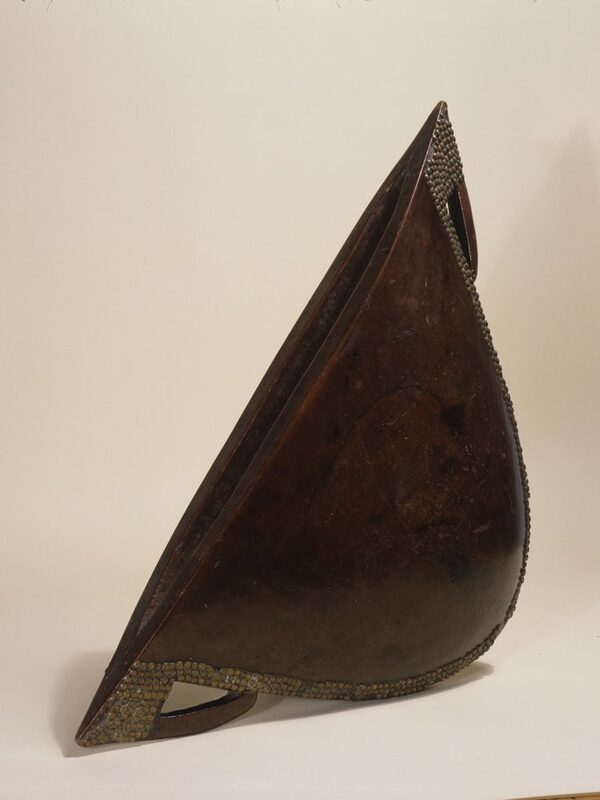 Their refined decorations, made using European upholstery nails, highlighted the wealth of their former owners—in the 19th century, the Ngombe had to pay a high price for imported nails in their region. 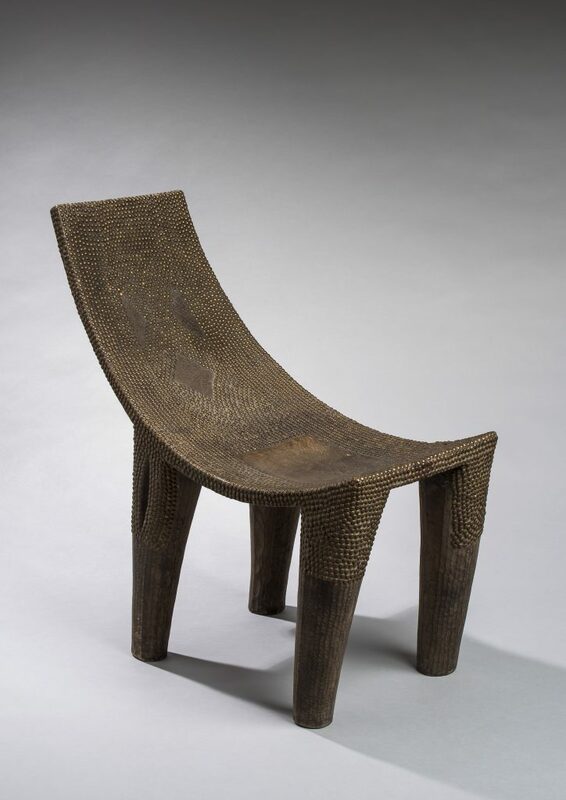 In the 1920s, elembo chairs inspired the cabinetmaker Pierre Legrain. The multi-bladed throwing knife is a significant African contribution to bladed weapons. Many groups in the north of present-day DRC, such as the Mabo, once used these weapons. In this vast region, the wide variety of blade shapes served as the signature of different ethnic groups. The museum lacks information on the origins of this beautiful ivory spoon, but the piece bears a certain formal resemblance to similar wooden spoons. 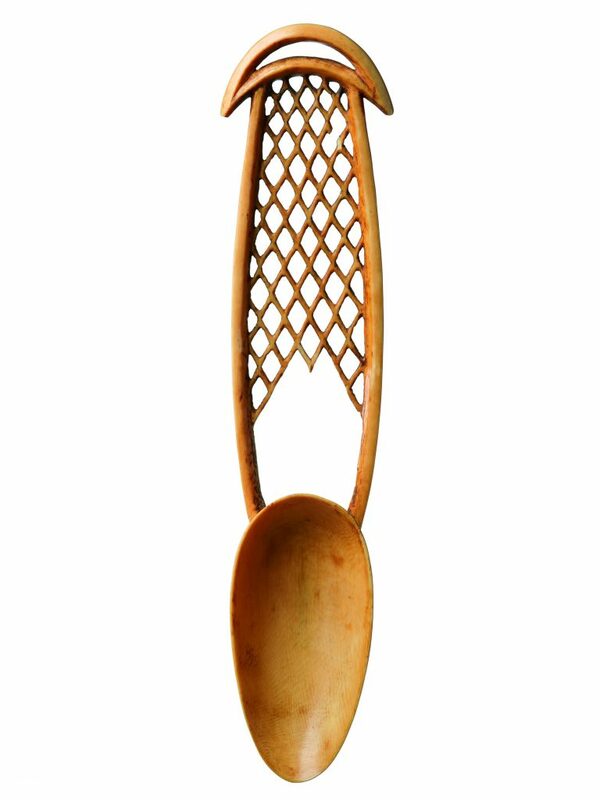 The spoons carved from a single piece of wood, many of which were collected between 1900 and 1910, come from the Makere, who used these utensils, known as nekekere, to prepare and eat meals. While Europeans refer to these instruments as ‘tulip drums’, the Mangbetu and some of their neighbours know them as nemandru, among other vernacular names. People played these drums, often in pairs, to celebrate various occasions. They accompanied some mourning songs and could be used to send coded messages. 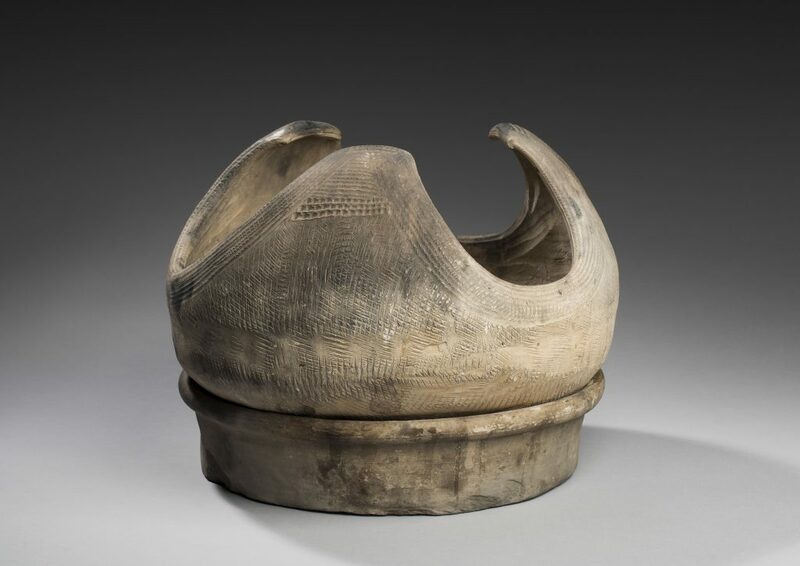 This ceramic piece was used as a brazier in pirogues and was designed to be able to hold a cooking pot. In the second half of the 19th century, these portable stoves appeared on the Congo River between Mbandaka and Lisala. In the Lualaba lakes region, ceramics of this kind have been found in tombs dating back to the classic Kisalian period (from around the 10th to the 13th century). 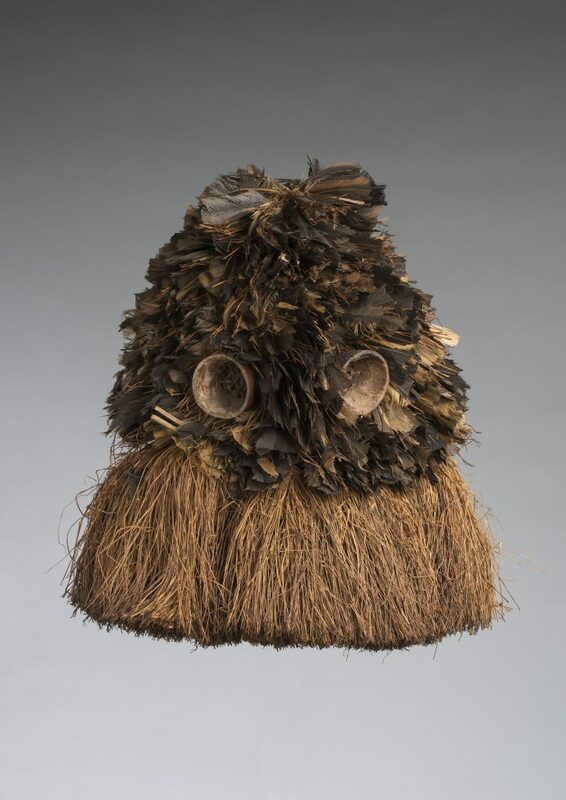 This mask, called a mweelu, was used during manhood initiation mukanda ceremonies to enforce dietary restrictions to which young men undergoing circumcision were required to comply. Mweelu were also worn outside of the initiation camp when going to ask for food for initiates in nearby villages. Fragile, ephemeral masks like mweelu have rarely been collected. In Rwanda, pipes are called inkono y’ itâbi (‘tobacco pots’). There are different models of inkono y’ itâbi, including ones often seen in the hands of Tutsi notables in photographs. Most artisans who make these delicate pipes belong to the Twa, a pygmy people. This type of work was created to adorn the tomb of dignitaries from the important bukota brotherhood. The purpose of the statue, sometimes called a kakungu, was to temporarily host the soul of the departed so he could oversee the quality of his funeral service. This particular example was decorated with an exotic colour, a laundry blue imported from Europe. The Soonde often call these well-rounded baskets with a square bark base kipiringa. Other cultural groups, such as the Pende, also made similar baskets, which could be hung in homes to protect various foodstuffs, clothes, or jewellery from insect or rodent attacks. They could also be used as travelling bags. 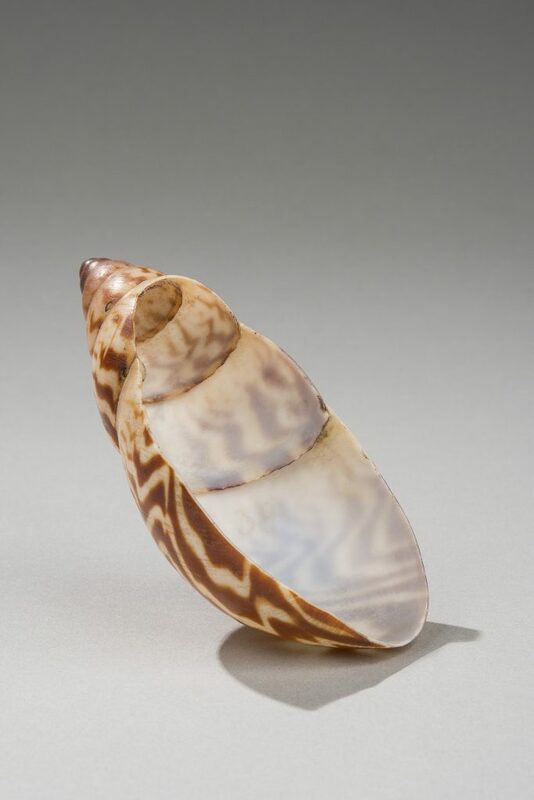 The shell of the agate snail traditionally served several purposes in the Congo. It could hold ‘magical’ ingredients, thus becoming a particular kind of fetish. Trimmed, as this one was, it could be used as a utensil and also allow etymologists to illustrate the relationship between cuillère, the French word for spoon, and the Latin cochlea—snail! 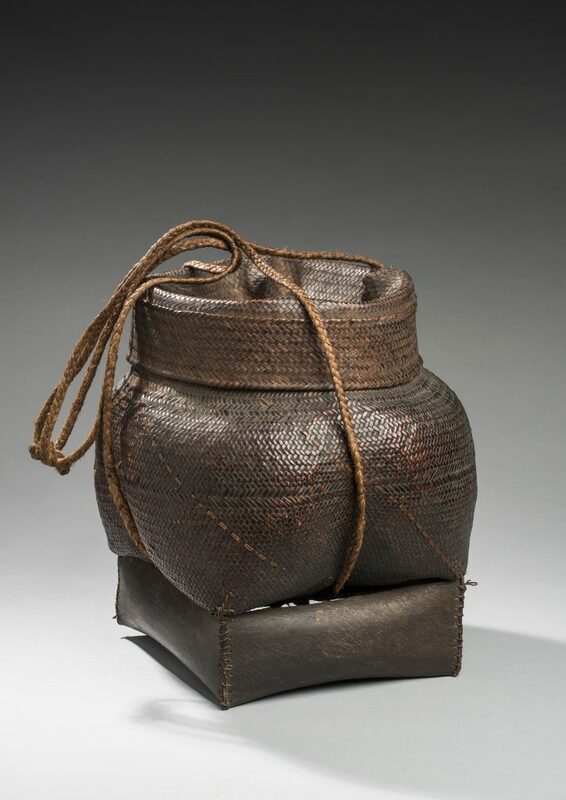 Called musaka by the Tshokwe, kabondo by the Lunda and zuùmbi by the Holo, this type of basket, made exclusively by men, was mainly used to store food. A ‘basket-thermos’, the musaka maintained foods such as bidia (a manioc porridge) at the right temperature. People also used musaka to store jewels, money, and other items. 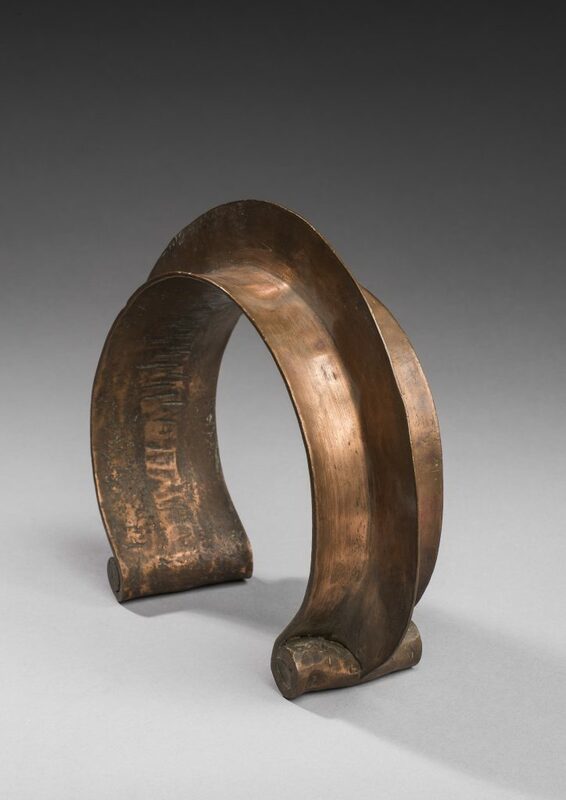 Mention of these elegant iron rings from the Ugandan-Congolese mountain areas begins as early as the 1890s. In some ethnic groups, a man might wear three or four of these torcs. 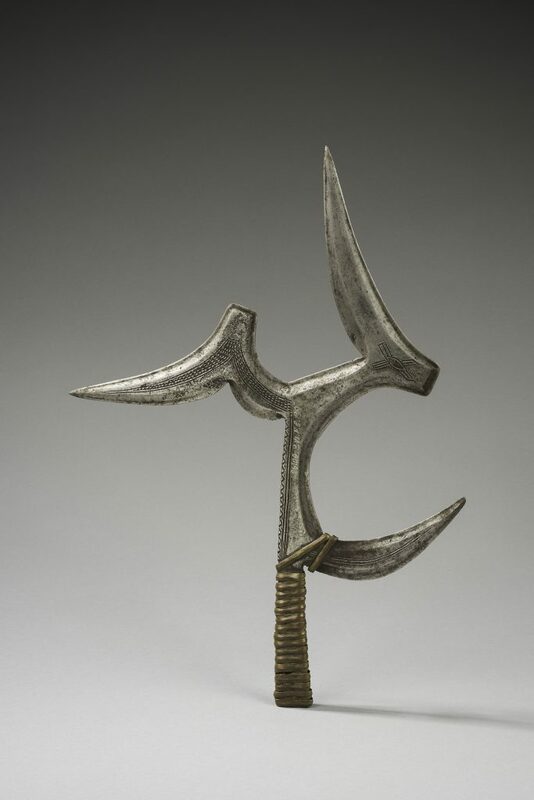 In the Congo, groups such as the Nande of the northeast and the Hamba wore such jewellery. Known sometimes as ekioliro, they seem to have been reserved for important people. Among the Kuba, this kind of ‘overskirt’ with wavy edges was called a ncák minen. This one is a variation, ncák minen’ ishushuna, which belonged to the wife of a nyim (king). High-ranking women wore ncák minen for certain occasions, such as the prestigious and difficult Itul dance that only the nyim or a few other important dignitaries could decide to organise. 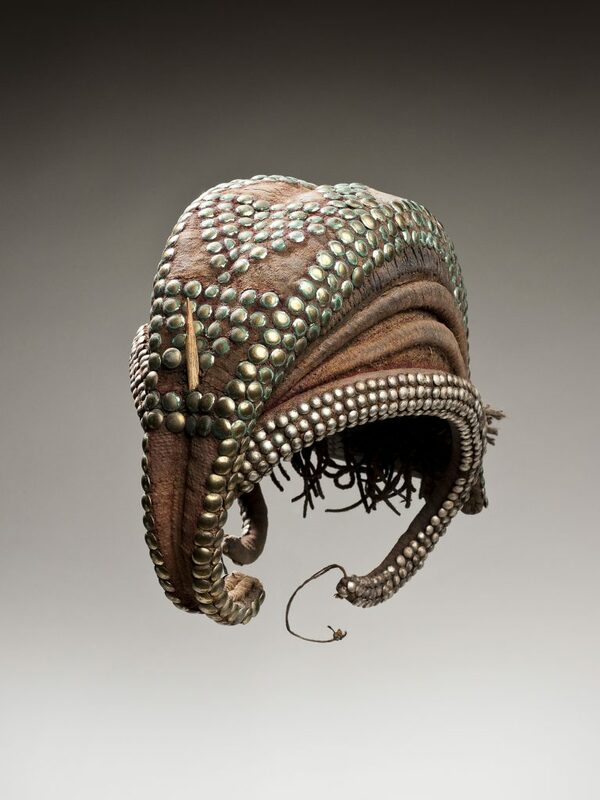 Mukot, this wig-headpiece worn by both men and women, was once worn by the Pende and some of their neighbours, such as the Mbala and the Kwese, once wore the mukot, a ‘wig-headpiece’ for both men and women. Sculptures (masks and statuary) from the area in which the mukot was worn sometimes also feature these adornments. At one time, wearing a mukot was a symbol of opposition to the westernization of mores. Once dried and emptied, a calabash makes an excellent container. 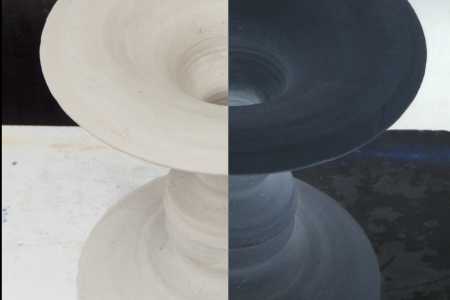 The artisan can use its natural shape or transform it by tying it when the fruit is still growing. 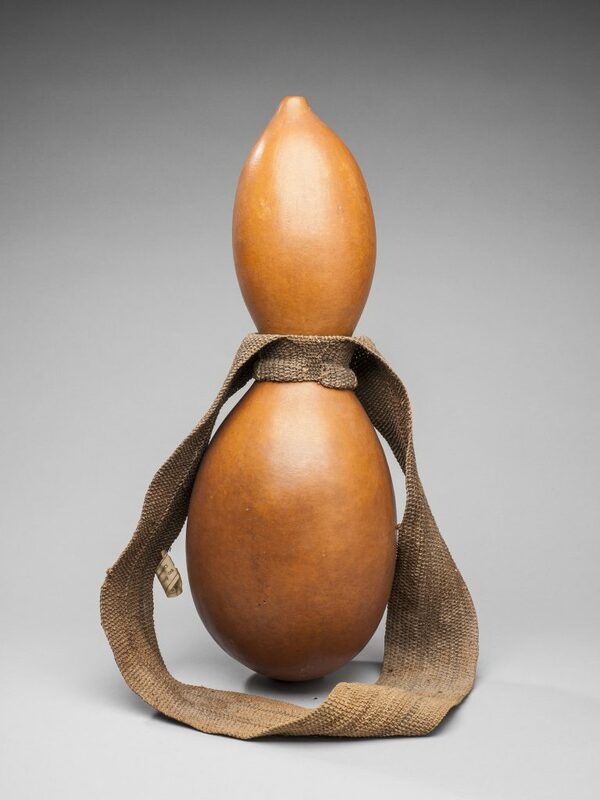 This calabash was used as a travelling canteen. The word for this container, nagbwanga, is also used to designate calabashes used as powder flasks. Shield, final quarter of the 19th century. Woven fibres, wood. DRC. 149 cm long. Inv. no. EO.0.0.19590. Chair, third quarter of the 19th century. Wood, European nails. Ngombe (DRC). 72 cm high. Inv. no. EO.0.0.17220. Soro throwing knife, final quarter of the 19th century. Iron and copper. Mabo (DRC). 40 cm long. Inv. no. EO.0.0.26109. Spoon, third quarter of the 19th century. Ivory. Makere? (DRC). 26 cm long. Inv. no. EO.1955.113.22. Slit drum, final quarter of the 19th century. Acacia wood, upholstery nails. Mangbetu (DRC). 82 cm long. Inv. no. MO.1960.39.1044. Three-lobed pot. Final quarter of the 19th century. Terra cotta. Iboko? (DRC). 25 cm high. Inv. no. EO.0.0.2242. Mask from the end of the first quarter of the 20th century. Plant fibres, gallinaceous and raptor feathers (Accipitridae sp. ), calabashes. Yaka (DRC). 50 cm high. Inv. no. EO.0.0.27616. 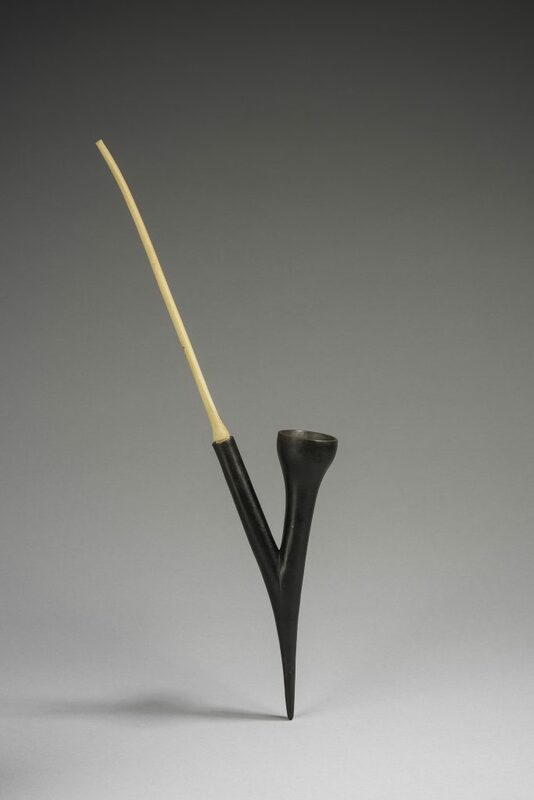 Pipe, third quarter of the 20th century. Ceramic, reed. Twa (Rwanda). 41.5 cm long. Inv. no. EO.1978.11.13. Statue, first quarter of the 20th century. Wood (Pterocarpus tinctorius), pigments (synthetic ultramarine). Metoko (DRC). 92 cm high. Inv. no. EO.0.0.32672. Basket, second quarter of the 20th century. Woven fibres, bark. Soonde (DRC). 36 cm high. Inv. no. EO.1953.74.3184. 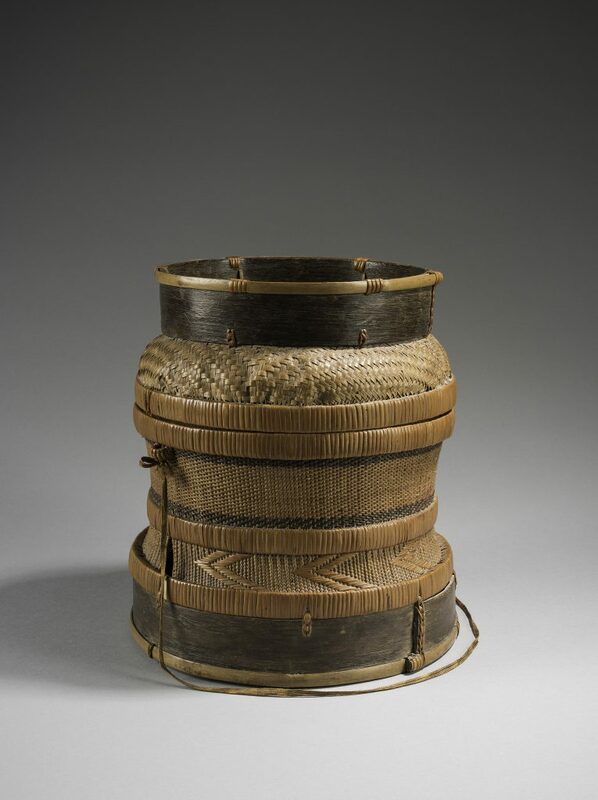 Basket, first quarter of the 20th century. Woven fibres, bark. Tshokwe (DRC). 26 cm high. Inv. no. EO.1974.30.2. Torc, final quarter of the 19th century. Iron. Kondjo-Nande (DRC). 18 cm long. Inv. no. EO.0.0.18811. ‘Overskirt’ with wavy edges, late 19th century. Textile. Kuba (DRC). 171 cm long. Inv. no. EO.0.0.27401. Headpiece, first quarter of the 20th century. Textile, plant fibres, soil, tukula (red dye), upholstery nails. Pende (DRC). 22 cm high. Inv. no. SJ.3037. Container, 1900-1910. Calabash, textile. Zande (DRC). 50 cm high. Inv. no. 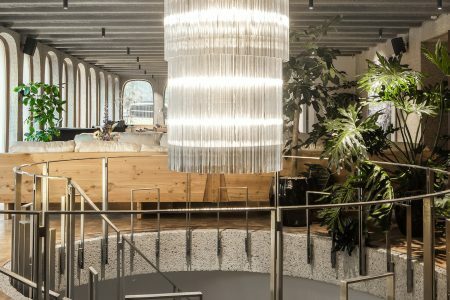 EO.0.0.8801.